The structure you set up with the Syllabus is visible to your students on the Course Home. You can preview your students' view by opening the Activities tool. Folders to organize your content into units, chapters, sections, etc. The Library to add activities and content from other courses, domains, and open educational resources (OER), like Khan Academy and OpenEd. Projects, which allow you to create and manage robust projects that provide authentic experience, enable group learning, empower students, and encourage critique, reflection, and revision. These features are designed to support the critical components of project-based learning (PBL). Click the thumbnail to expand and close folders. An + Add to... button appears at the bottom of each folder. Click it to add new Folders, Projects, or Activities to that folder. 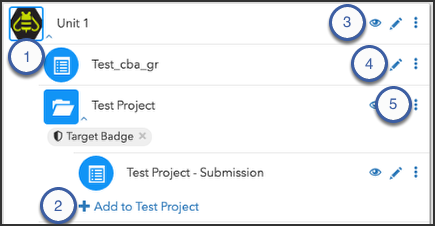 Toggle the eye (visibility) icon to control whether the selected folder or activity appears in your students' Activities tool. Use the pencil (edit) icon to edit the selected folder or activity. Use the side menu to Preview, Move, Delete, or Duplicate the selected folder or activity. You can also move folders and activities by clicking and dragging and dropping them. Create individual and group projects that support project-based learning (PBL) and allow students to explore cross-disciplinary activities, collaboration, critique, and revision. Will Buzz allow you to copy items from one curriculum map (trig) to another map (physics)? You can already copy or link to items from other courses today. To do so, you would use the Digital Library. 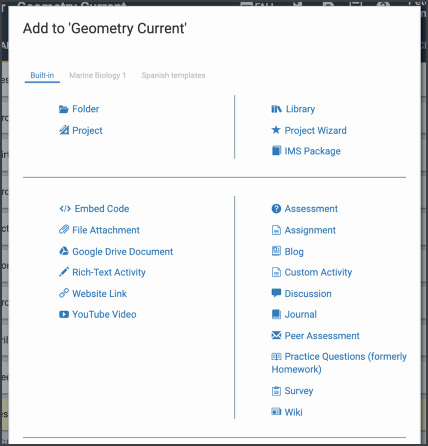 Navigate to the Curriculum Map for the course you want to use the items. Select the folder you want the items to appear in. Select the Search Library option. You may search or browse the available content. To browse your own content, select your domain and then the course you would like to use content. Select items or folders you would like to add to your course. At the bottom of the window, you can choose Create Link or Create Copy. Create Link will allow for the items to be used in your course, but the content will not be editable. This will allow you to receive updates as they may occur. Create Copy will make a static copy of the content. Fully editable but will not receive any updates. I hope this helps. Please don't hesitate to ask additional questions as a comment to articles or creating your own discussions.